After meal planning for 5 years, I’m sharing my best 10 tips to make meal planning easy for you and your family. Give them a try, I bet you’ll love it. What if I told you that I can plan a whole months worth of meals in 30 minutes or less? I may sound impossible, but it’s absolutely true. Still not convinced? Last October I actually timed how long it took to create our November meal plan and the total time, including distractions, came to just over 28 minutes. By the way, I wasn’t even at home when I did it. But so many women still say that it’s too difficult, and that there’s no way to make monthly meal planning quick and easy. They say that it takes too long, or that they can’t come up with enough ideas for a whole month. I’m here to tell you that those arguments just aren’t true. We’ve used monthly meal planning for nearly 5 years, which means I’ve figured out a few major cheats that make monthly meal planning easy and fast. And best of all…it can work for your family too! Are you ready to get started? 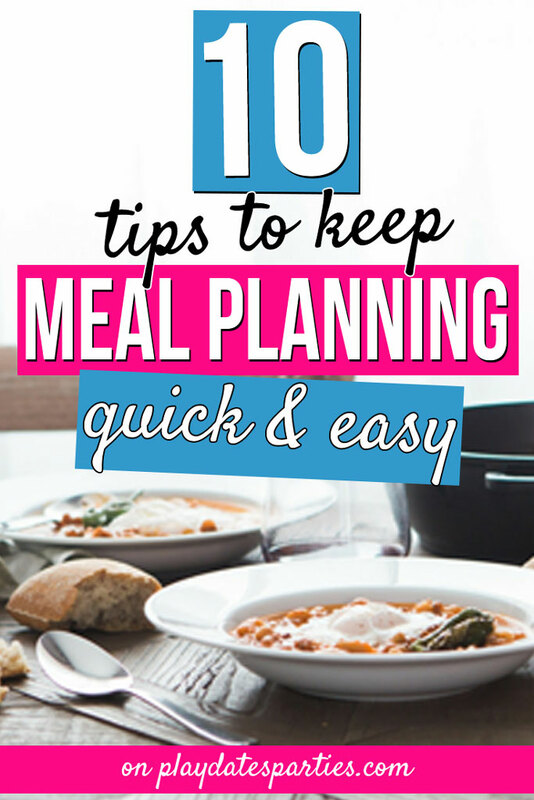 Here are my 10 best tips to make meal planning easy for you and your family. Systems like these are so personal. Many people like to keep their meal planner in a household planner, or to use a family planning app. I personally prefer using a spreadsheet so I can keep a copy of links to recipes I love. Whatever you choose, make sure it’s a system that works for you. 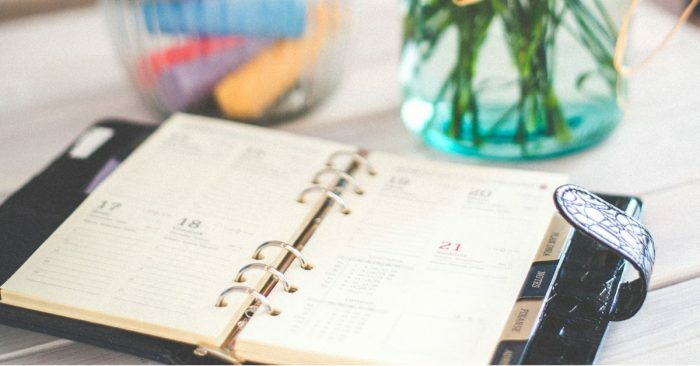 Have your family calendar next to you as you do meal planning. Before you even start to look at recipes, make a note of nights when you know you’re gong to be busy. For me that’s noting extracurricular activities like dance and gymnastics, as well as nights when my husband already knows he’s going to travel. Do you have ingredients in the refrigerator that are about to go bad? Are there any pantry items that should be used up? Is your stock of freezer meals getting pretty high? Maybe it’s time to use some of them up, or to avoid recipes that will end up with a lot of extra bulk ingredients that will need to be frozen. RELATED>>>>Here are some awesome ideas to transform your leftovers! Include a weekly leftovers night. Leftovers night deserves it’s own category, separate from dinner night themes. Pick one night each week and then stick with it. For us, it’s Thursdays. Those are busy nights for us already, and by that time of the week, I’m just ready to relax. That makes it the perfect night for us. Pull out all of Your Favorite Recipe Resources at Once. Now it’s time for the good part! Pull out your favorite go-to recipe resources and have them all ready at once. I have two or three cookbooks that I love to use over and over again. At the same time, I also have a few different Pinterest boards that I use for meal planning. I even have a board dedicated entirely to easy dinner recipes for busy families! Make a note of any recipe that sounds interesting to you…but don’t put them on the calendar just yet! 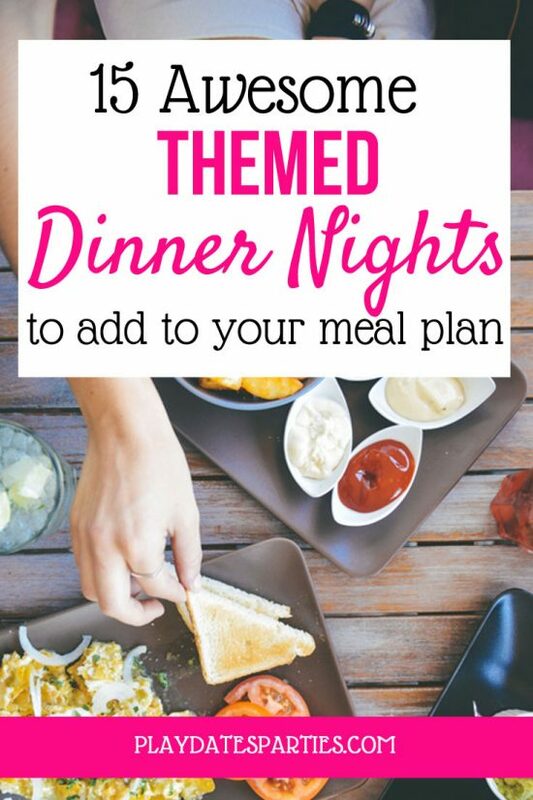 Plan for easy meals on your busiest nights. Now, look at the recipes you’ve picked. Which are the easiest? 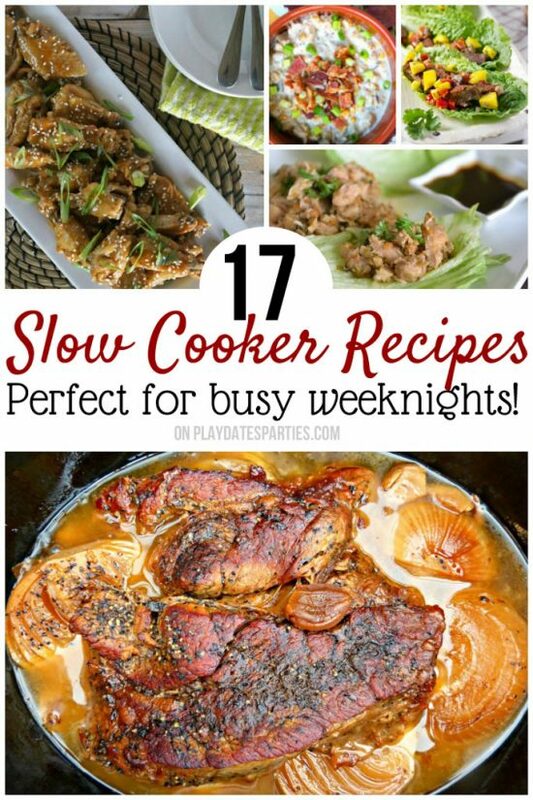 If you’ve found a crock pot recipe or sheet pan recipe that you want to try…those are awesome for nights you’ll be playing after-school chauffeur. And planning those meals first, makes sure you don’t put them on a night when you’ve got a few extra minutes to spare. Plan a family favorite at least once a week. The Husband and I are trying to expose our children to a variety of cuisines, which means some dinners end up being a bit of a battle. We try to balance it out by making sure that once or twice a week we’re offering something that everyone loves. Most of our weeks include at least one meal that can be ‘thrown out’ of the plan. This way the Husband can cook if he wants to, or we have the option to go out for dinner. If I’ve learned anything, it’s that sticking to a rigid meal plan is just too frustrating in the long run. Keep a record of the meals you made each month in the past. Now, this is my number one tip of all. I’m a big fan of keeping a recipe bank. But not just a simple list of recipes we like. I keep track of when we made it too. It may seem silly, but have you ever noticed that you wanted hearty warm meals in the winter, and lighter meals in the summer? Keeping our recipe bank sorted by month means that I can easily scan for favorite recipes that match our seasonal tastes. How Long Does it Really Take to Plan a Month of Meals? Now, obviously, when you’re first starting out, it will take longer to find your groove. And 30 minutes isn’t always my norm. On average, I schedule about 45 minutes per month to create a solid meal plan. And if it takes less than that, then it’s time to go make a quick little craft. Don’t expect to get your first few meal plans done in 30 minutes. Give yourself a solid hour and a half for the first couple months. Yes, it sounds like a lot. But the reality is that all those minutes your spending each and every day figuring out what to do for dinner are adding up to a whole lot more than even 90 minutes. This is the perfect time to get started. Set some time aside in the next week to plan your next month’s worth of meal. Take back all that wasted time so you can have more time to do the things you really love. Great tips! I grew up with a fairly regular schedule of meals: Sunday was the big family dinner (a roast, turkey, ham), Monday was leftovers from Sunday (but reconstituted as a completely new dish because my dad hated leftovers –I think it was a Depression era thing), Tuesday was chicken (usually baked chicken breast with steamed broccoli and rice pilaf), Wednesday was Prince Spaghetti Day, Thursday was usually chicken stir fry, Friday was fish (very Catholic household), Saturday was steak with baked beans and sauteed peppers and onions). It was very predictable! Now that I’m a parent and cooking for four after a full day’s work (or my husband cooks), I am grateful for some predictability. We’re not as rigid as my parents were though. For us Mondays are usually Bip Bim Bop (Korean rice bowl), paninis, or a big salad; taco Tuesdays are totally a thing; Wednesday pasta (though not always with “gravy” sometimes its clam spaghetti, anchovy pasta, or tortellini with pesto; Thursday is often something from the freezer; Friday is pizza picnic (we watch a movie in the living room); and then Saturday and Sunday are often more time consuming meals or we grill something or we have a date night and the kids get mac and cheese with a babysitter. 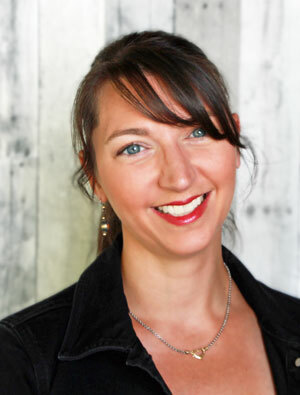 I totally need these tips, thank you for sharing them at The Really Crafty Link Party. Pinned! Thanks for the tips. I really want to start meal planning and prepping a lot more, so that weeknight dinners can go easier, and I’m not resorting to unhealthy or not so great foods! As a big fan of meal prep and menu planning, those are some GREAT tips! I’d love for you to share over at a new party called Let’s Party https://themarkandjanshow.com/2018/01/02/lets-party-6/ … we look forward to seeing you there! This is something I need to get on top of. You have some great ideas here. I’m going to pin this for some inspiration later! I know that this can be done! Now that it’s just the two of us I am not scheduled so regularly, although we don’t eat out often and I still cook a lot. Thanks for sharing with SYC. Great ideas! I try to do it weekly with plantoeat.com. The website will also produce a shopping list for you. It’s been a while since I planned meals. Planning in under 30-minutes is great. If I worked outside the home (and still had littles) I would outsource this. I’d probably subscribe to a menu service. Most of them have grocery lists which makes it easier. We’re at a point where we eat pretty much the same stuff so always having the basics on hand guarantees they can all find what they’re craving. This is a lot like I do it too! I occasionally try to plan a week at a time and it feels unccomfortable. Even if we adjust for life happening, I like having that plan. Thanks for sharing with Party in Your PJs! Okay, I’m taking notes here. Meal planning is definitely one of those things I really need to work on! Thank you for sharing your wisdom.